Diplomatic balancing in Northeast Asia could inhibit the growth of a new, stable regional order. Northeast Asian politics is an intriguing but bitter pot of jambalaya for scholars, journalists, and pundits in and across the region. Problems, concerns, disputes, conflicts, and procrastination on various kinds of bilateral and multilateral issues have made the situation in this region a good case study for diplomatic balancing among states, including great, middle, and small powers. This diplomatic balancing does not necessarily refer to the classic “Balance of Power” theoretical approach, rather it emphasizes the diplomatic efforts of certain states to maximize their economic and political gains from several (typically two) important partners. So “balancing” here does not mean to “balance against,” but to seek gains from two partners in a “balanced” way. For example, as the relationship between North Korea and China becomes more complex and hard to predict, various analyses have argued that Pyongyang is seeking closer ties with Russia. Earlier this year, North Korean official Kim Yong-il, secretary and director of international affairs for the Korean Workers’ Party, claimed that the friendly bilateral relationship between the DPRK and Russia has reached a “higher level.” As Paul Haenle and Anne Sherman pointed out in a recent piece for The Diplomat, North Korea’s diplomatic outreach to other powers (including Russia) is Pyongyang’s way of counterbalancing China’s tougher stance. 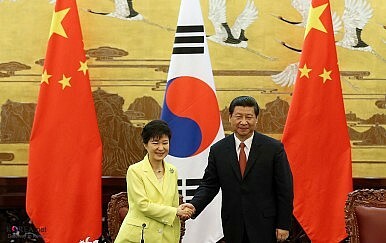 Meanwhile, China intends to achieve a diplomatic balance in the Korean Peninsula. China may view certain North Korean behaviors as provocative while closer ties with South Korea are a necessity both economically and geopolitically. Lastly, striking a balance between China and the United States obviously has always been on the top of South Korea’s agenda. This diplomatic approach does run the risk of Seoul facing growing concerns or even suspicions from both China and the United States, particularly on issues like the role of the Seoul-Washington alliance and the deployment of the THAAD system. Diplomatic balancing in Northeast Asia is practical for the states involved but remains worrying for several reasons. For example, states in this region that are engaged in diplomatic balancing do not necessarily seem to be focused on the equilibrium of power between the rival coalitions. Instead, such practices seem to be aimed either at “securing the greatest common divisor” (see, for example, China’s political intentions and security concerns regarding its policies to North Korea and South Korea) or at “multiplying strategic gains” (as both Koreas are attempting to do in their diplomacy toward great powers like China, Russia, and the United States). These policies are the results of very careful calculations about regional international relations, particularly based on the fact that a new, overwhelmingly dominant regional order has yet to emerge. This is not a period of war, but states may find good reasons to play this balancing game out of a number of anxieties and concerns. States are particularly unsure about the “return” of the United States, especially as China’s confidence in challenging the U.S. predominance in this region may continue to expand. But on a deeper level, there is still no consistent regional order, especially a consensual one. The regional states are virtually on their own. Hence, this diplomatic balancing game is worrying. It may not threaten the minimum survival of states or prevent the maximization of national interests, but it could obstruct the task of finding both the political will and a consensus to jointly address key regional issues. Even further, on a grand scale these separate balancing acts could prevent regional reconciliation on enduring matters. In this regard, diplomatic balancing is both a product of and a contributor to the current unstable regional circumstances.